Liberty men’s Division I (DI) hockey team split its first home series of the spring semester 1-1 against Rochester College Jan. 17 and 18. The 11th-ranked Flames came out slow in their first game against the unranked Warriors, who seized the opportunity to post a 2-1 upset win. The Warriors scored midway through the first period, then settled into a tight, efficient defense, effectively shutting down the Flames preferred passing lanes and slowing down their forecheck. The Flames front lines made a strong rallying push, peppering Rochester with 40 shots on goal before the night was over. Forwards Ryan Kerr, Christian Garland and Tyson Street provided consistent energy, while forward Ryley Egan finally put Liberty on the board on assists from defenseman Cam Bakker and forward Grant Garvin in the third period. Street echoed his linemate’s disappointment, crediting the Warriors for frustrating the Flames efforts. True to their word, it was a tighter Flames unit that took the ice and delivered a 7-3 win in the second game of the series. Liberty struck first on a blistering goal from forward Kyle Garcia (defensemen Ben Hughes and Steven Bellew on the first and second assists, respectively), allowing the Flames to relax and focus on the speed and zone entries Handy emphasized after the previous night’s loss. Assistant Coach Jake Hannon made the call to swap offensive forward Robert Ward for more 200-foot-minded Bram Erickson on the top line with alternate captains and forwards Luke Hannon and Lindsay LeBlanc balancing the line and resulting in five points for Hannon, four for LeBlanc and three for Erickson by the final buzzer. Between key personnel changes and a much-improved forecheck, the Flames found the back of the net six more times before the night was through. Hughes, Erickson, Bakker and Luke Hannon lit the lamp in the second, and Luke Hannon and Erickson each added second goals in the third. 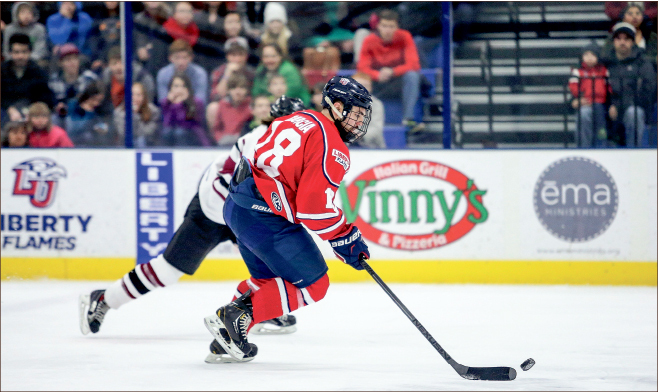 The defense still lagged at times — Rochester scored twice in the second period and once more in the third — but the Flames regrouped and responded every time. If that is the case, the Flames will test their strength this weekend with games against Ohio University at 7 p.m. Friday and Saturday, Jan. 23 and 24.